Put oil into a large heavy bottom pot and fry the bacon pieces for 2 to 3 minutes. Now add the diced onion and cook until translucent. When they are ready add the chopped sausages and stir all for 2 to 3 minutes. Now add the whole tube of tomato purée and continue to stir for several minutes. Next add the hot water, it needs to up to at least two thirds of the side of the or a tad higher. Season with salt and pepper. Then bring this to the boil and now add your dried spaghetti. I know it will seem watery but trust me the starch from the pasta will help the sauce to thicken. Once spaghetti is incorporated turn heat to medium and stir frequently to avoid spaghetti sticking to bottom of pan. If you want a thicker sauce add more tomato purée if you want thinner top up with water. The meal is ready once the pasta is cooked or you can let the pasta steep for a while. We serve it with lots of grated cheddar cheese on top. You can add more sausages, bacon or onion to your taste, but we get 6 to 8 servings out of this. It heats up well in the microwave too. So easy to make if your busy and have several hungry mouths to feed on a tight budget. 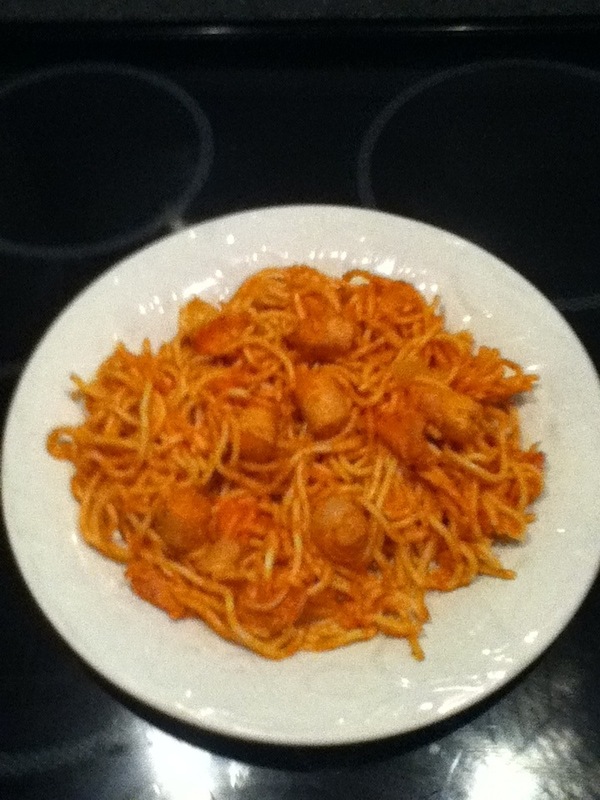 Tags: bacon, cheddar cheese, one pot meal, onion, Pasta, sausage, spaghetti, Tomato, tomato purée. Bookmark the permalink. Not only kids…. Big kids too like moi !